October is National Bullying Prevention Month. Photo by Kat J on Unsplash. Bullying takes various forms, from physical abuse to verbal attacks and rumor-spreading, but always, the intention is to inflict harm. October is National Bullying Prevention Month, with a goal of raising awareness about bullying and teaching adults and children how to prevent and stop it. “It is imperative to create a school culture that embraces people’s differences, addresses underlying issues that lead to bullying, and creates an expectation that the behavior won’t be accepted,” said Mary Vineis, the director of Community Response and Education at NewBridge Services. In schools, Vineis teaches children ways to handle bullying and deal with conflict, and educators about creating a safe environment. Students learn coping skills and approaches to building self-image so they are less susceptible to other people’s opinions. Children learn to react non-emotionally to hurtful words and to take power away from a student who is bullying by not engaging him. NewBridge also offers programs for parents, to let them know what the latest threats are and how best to cope with them. About one in five students is bullied, with more incidents occurring in middle schools, surveys have found. All forms of it cause suffering that can leave serious emotional scars. Children who bully also are affected: studies show that children who bully are more likely as adults to have trouble keeping a job and maintaining relationships, and are more prone to addiction, Vineis said. Bullying also has been found to have negative consequences for children who witness an incident but do nothing to stop it. “Children who are not the actors in a bullying incident, but rather bystanders, must be taught that they can have a powerful role in shutting it down,” Vineis said. 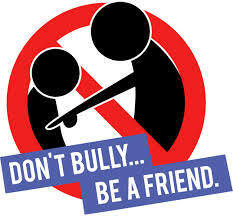 A 2012 study found that when bystanders intervene, bullying stops within 10 seconds in more than half of incidents. “When bystanders say or do nothing, the kid who is doing the bullying may interpret that as them endorsing the behavior,” Vineis said. While most bullying takes place on school grounds and buses, smartphones and apps have expanded its reach. “Too often, children unwittingly become agents of bullying when they share rumors about another student on social media,” Vineis said. Empower children to prevent and stop bullying. Treat everyone with respect. Stop yourself from saying or doing something that could hurt someone. And if you think you’ve ever bullied someone, say you’re sorry. If you’re being bullied, look at the person who’s doing it and tell him or her to stop in a calm, clear voice. If you can’t, walk away. Talk to a trusted adult, who can help you make a plan to stop the bullying. Staying near adults and other kids can help you avoid bullying situations. Stay safe online. Think about what you post, knowing someone could forward it. Don’t share anything that could hurt or embarrass someone. Don’t share passwords with friends or other classmates (but do share with your parents!) Check your security settings to ensure only the people you want to see your posts see them. If you get a message or see a post that alarms you, talk to a trusted adult. Stand up for other kids. If you see bullying, let an adult know. Reach out to the person who was bullied so they know they are not alone. For more information about in-school program provided by NewBridge, contact Vineis at 973-686-2228 or visit newbridge.org.